University of California, San Diego construction officials, San Diego Supercomputer Center officials, Barnhart Inc. and Esherick Hamsey Dodge & Davis Architects (EHDD) celebrated the topping off concrete on the 80,000-square-foot expansion of the San Diego Supercomputer Center (SDSC). 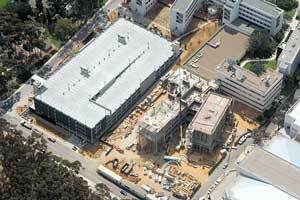 The expansion at the UCSD campus, will double the total size of the facility to 160,000 square feet upon completion. Nearly 7,328 cubic yards of concrete was placed and 875 tons of rebar used to top off the cast-in-place structure. Pacific Southwest Structures and Quality Reinforcing are the concrete and rebar trade contractors. UCSD and SDSC officials working on the project include Marye Anne Fox, chancellor; Francine Berman, director of SDSC; Boone Hellman, associate vice chancellor for facilities design & construction; Jim Gillie, director of construction services; and Chris Cochallas, project manager. Barnhart team members include Anton Greenville, Frank Haslinger, James Tovar, Stan Streit, Tom Field, Justin Taylor and Carol Howard. The SDSC expansion also features an enlarged machine room, offices, meeting rooms as well as a 250-seat auditorium. The existing facility is remaining open throughout construction. The expansion is scheduled for a June 2008 completion. The project has already garnered an award from the Higher Education Energy Partnership in 2005, for its innovative HVAC systems. The Supercomputer expansion will allow the national science, engineering and technology center to house more data, supercomputers and a staff of 400. The expansion will continue to be one of the largest storage resources in the country, offering more than 18 petabytes of tape storage and 1.4 petabytes of disk storage. For more than two decades, the San Diego Supercomputer Center (SDSC) has enabled breakthrough data-driven, computational science and engineering discoveries through the innovation and provision of information infrastructure, technologies and interdisciplinary expertise. A key resource to academia and industry, SDSC is an international leader in Data Cyberinfrastructure and computational science, and serves as a national data repository to nearly 100 public and private data collections. SDSC is an Organized Research Unit and integral part of the University of California, San Diego and one of the founding sites of NSF's TeraGrid.